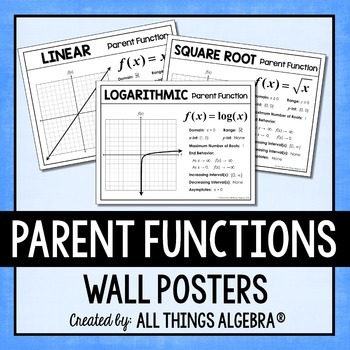 This is a set of nine parent function posters to display in your classroom. 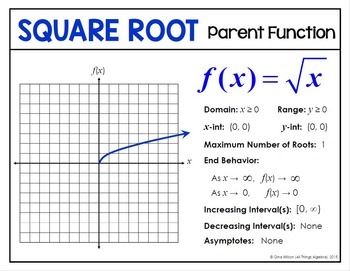 Parent functions included: linear, absolute value, quadratic, cubic, square root, cube root, reciprocal, exponential, and logarithmic. 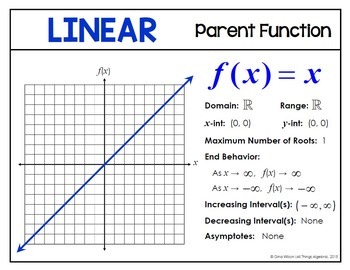 Each poster gives the parent function, graph, and the following characteristics: domain, range, x-intercept, y-intercept, maximum number of roots, end behavior, increasing interval(s), decreasing interval(s) and asymptotes. Both color and black and white versions included.